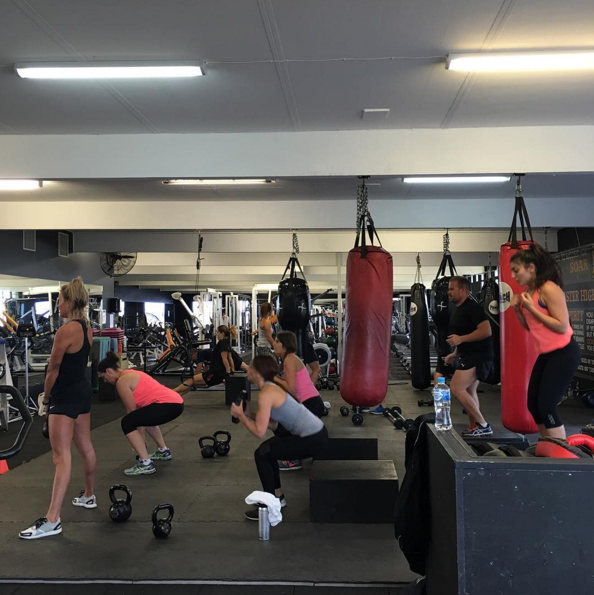 At Fitness Addix we have always prided ourselves on our group training sessions. We are constantly keeping our sessions fresh and non-repetitive; and we also look to make use of every minute during the class. Sessions run for either 60, 45 or 30 minutes and involve a challenging mix of cardiovascular, resistance, boxing and full body training, so be prepared to sweat! Group fitness classes are a great and effective way to work out the entire body while having fun! No bookings or registration is required to join a class. Bring your friends and get addicted today! Classes we run include Boxing, Weights, Body Addix, Leg-up/Upper, Cagefit, Addix and AddixCamp. Learn more about each class below and watch our videos to get an idea about what our classes are like! High Intensity boxing drills that are focused on improving and developing your boxing technique and skills. This class is based on learning, working hard and developing skills as well as fitness so you can leave the gym knowing that you are participating in real boxing and learning the right way. Cagefit is based on the structure of MMA and provides a full body workout. It consists of longer rounds to build endurance while working on strength and fighting technique simultaneously. There are four key elements that are focused upon: endurance, strength, power and core fitness. A blend of these will be included in all classes! A class dedicated to activating, strengthening and stabilizing your entire body. It won’t all be fast paced but the work will never stop. Our goal is to develop and strengthen not only your body but also your mind. Too often we forget about getting back to basics and ensuring our fundamentals are solid. This class will help you work on muscular strength, assist in developing skills and technique and help you burn off that weight with different methods of pure weight training. A variation of exercises that focus on muscles in the upper extremities of the body combined with short burst, high intensity or low intensity exercises to improve overall strength and fitness. A Fitness Addix original class that combines multiple different workout styles, incorporating exercises that cover all muscle groups. Our focus is to get you working harder for longer, increasing your overall strength and cardiovascular endurance. Our very own spin on your traditional boot camp, Addix Camp uses the ideas of a boot camp style session with an emphasis on strength and cardiovascular sustainability. Prepare for a full workout! Conditioning is almost everyone’s number 1 goal; to look good and get toned. In these classes our focus is more on body weight and high rep style of training, in conjunction with non-stop mentality - upper, lower and mid body movements, using Kettlebells, Barbells and Dumbbells. Don't be afraid to try it out! All our classes are beginner friendly and accommodating; a great atmosphere for achieving. Refer to our timetable here.